Williamsport, PA - Lycoming has always been known for having a dominant defense. Over the years, the Wiser gang have been characterized as diving, flying and hard hitting. So far this year, after a rough start against the River Hawks, they are back to their Warrior legacy. This is what we know after three games. 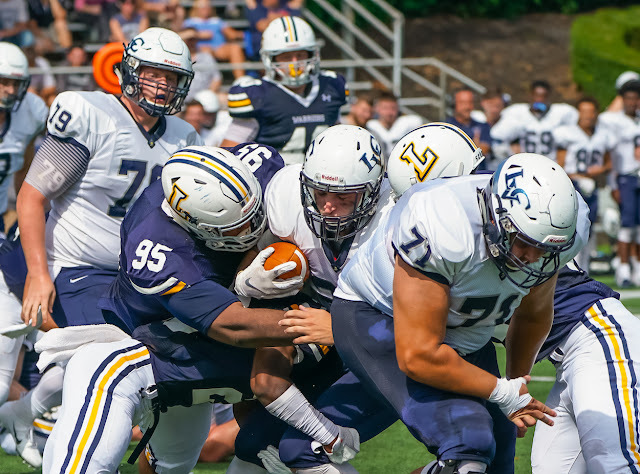 In the past two games, the Lycoming defense has allowed just 21 first downs, with Widener notching 11 in a 33-19 loss and Lebanon Valley getting just 10 in a 23-10 loss. The Warriors have allowed 399 yards of total offense to the two opponents, which has propelled the team into a familiar position - the top of the MAC in total defense (252.3). The Warriors also lead the MAC in pass efficiency defense (90.58), sacks (3.33) and they are second in both passing yards allowed (127.7) and rushing yards allowed (124.7). The Warriors have led the MAC in total defense 18 times in the tenure of 45th-year co-defensive coordinator Steve Wiser. The Warriors held Lebanon Valley to 10 first downs and 60 yards passing in their 23-10 win. 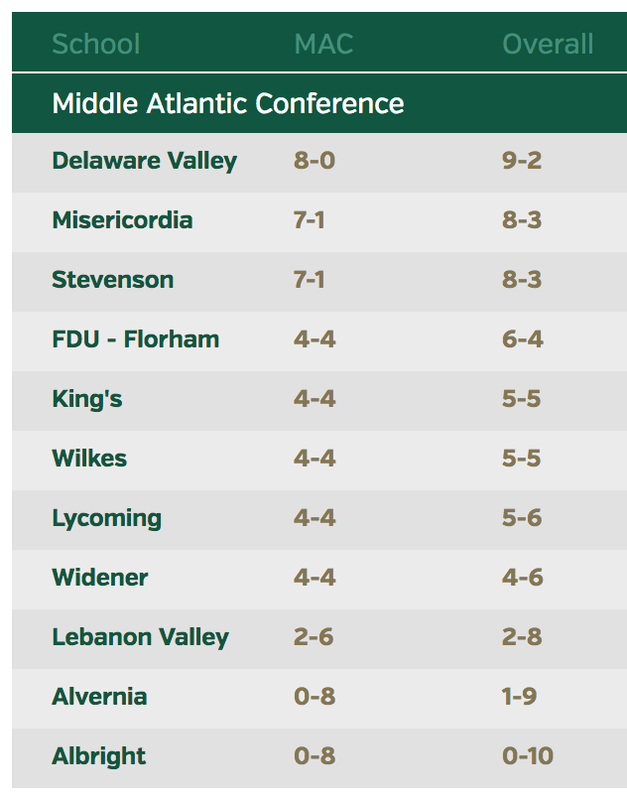 It was the first time since facing Misericordia on Nov. 10, 2012 that the team gave up 10 or fewer first downs and the first time since holding Stevenson to 85 yards passing on Oct. 4, 2014 that they gave up less than 100 yards passing. After opening the season by allowing 38 points to Susquehanna, the Lycoming defense dominated Widener in Sept. 8's 33-19 win. The win snapped a four-game losing streak to the Pride, the longest in the history of the rivalry. It was also the first time that the Warrior defense allowed fewer than 200 yards of total offense since the team allowed 184 to Stevenson in a 31-10 win on Oct. 4, 2014. While several players in head coach Mike Clark's 11-year tenure have changed positions, moving from the defensive to the offensive side of the ball, few have done what sophomore Kyle Pierce has done. 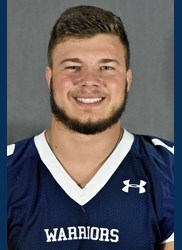 The Berwick, Pa., native, has transitioned to the offensive side of the ball as a starting offensive guard while also continuing to serve as a defensive tackle for several snaps a game. 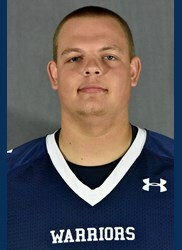 Pierce moved over to offense during Week 2 at Widener and has stayed in the position. He has made three tackles on the defensive side of the ball this year. Two Warriors have reached 100 career tackles this year, with both seniors Dominic Loffredo and Joe Pinzka reaching the milestone. Loffredo reached the milestone with his first of two stops against Susquehanna in the season opener. Pinzka, a safety, had 11 tackles as a freshman, 33 as a sophomore and 45 as a junior before posting 15 stops in the first three games to reach the milestone. Senior cornerback D.J. Boyd is also just one stop shy of the mark, as he posted 25 tackles as a freshman, 13 in an injury-filled sophomore year and 52 as a senior before notching nine this year.